A 7.8 magnitude earthquake struck Iran, near the border with Pakistan, at 14:44 Oman time on Tuesday at a depth of 73 miles, reported by the US Geological Survey office (USGS). In interesting instant reports from people around town, it appears it was felt most by people in Ghubra / Azaiba end of town, people in Qurum / Shatti didn't appear to feel the tremors much at all. It was felt in Hamriya, Hatat House area. Yeah we felt it here are Suhail Bahwan Automobiles in Qurum. Yes in Shatti Qurum too. Yes, in Ghala Industrial Area. Quite a strong tremor here in Wattayah . We vacated our building immediately . Felt it in Jawharat Shatti but only at the beach end - all the clothes on my rail gave a little shudder. felt for 8 secs in Madinat sultan qaboos! Feamaanillah! Is it gonna happen again. Hi yes we are in a penthouse on muscat hills golf club, it made our fillings rattle. oh yes definitely felt that in Shatti right near Al fair !! in Wuttaya........quite a rumble! Thought it was my stomach telling me i'd missed lunch!! Nothing around Seeb City Centre. Yes we felt in rex road ruwi. Yes, felt it here in Qurm (Sultan Centre) area. Even at The Wave Muscat! Felt it in the Wave too... Quite strongly... Sofas, plants were all shaking!! The whole block was moving! They say there'll be an aftershock as well! yes in beach 1 building , qurum!! Felt the tremors in MBD area, Ruwi. yes we felt the tremors at madinath al qaboos. Yes, shatti felt it 2.
alkhuwair mct holiday area ya felt tremors for few secs ppl vacated buldg.. Felt in the area of north ghubra near indian school. Yes, Felt in Wadi Kabir in Al Hassan company & we also evacuated the building for 10 minutes. Al ansari building was too felt.. Yes, strongly felt in Sur also. We felt the earthquake very badly in Wadi Kabir. Our whole buiding has come down!! HORRRIFYING!!!!! Yes in Bousher, 10-15 seconds in total. My dogs slept through it though! yes felt in CBD area. all offices were asked to be vacated immdtly. We felt the earthquake in Dawood Complex , Sohar. Is it true tomorrow's been declared as a public holiday to allow people to recover? Oh I need a holiday tomorrow to recover. 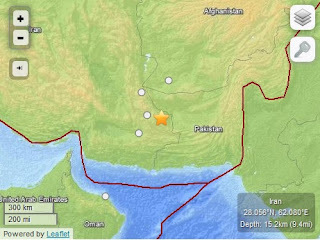 I live in Ghobra and i felt the earthquake which lasted for about 3-4 minutes. it happened around 2:46 pm. It was scary! I felt the bed shake in shatti. Yes we felt it in Rex Road. We were shocked we did not know what to do. My chair was shaking on which i was sitting. Yes. We felt it in Al Khuwair 33, near Muscat Dunes Hotel. The whole building, tables and chairs were shaking at various intensities for about 45 seconds. I felt it too in madinat qaboos. Though, I've heard rumours that it might happen again. And even worse about 10 magnitude earthquake in the gulf countries by 25th of april to the 30th.. I hope its untrue. May Allah have mercy on us.